There are some novel ideas being spelled, by some “property industry experts.” Ideas seeing as lifelines, to counter, the falling property market. I can only imagine. 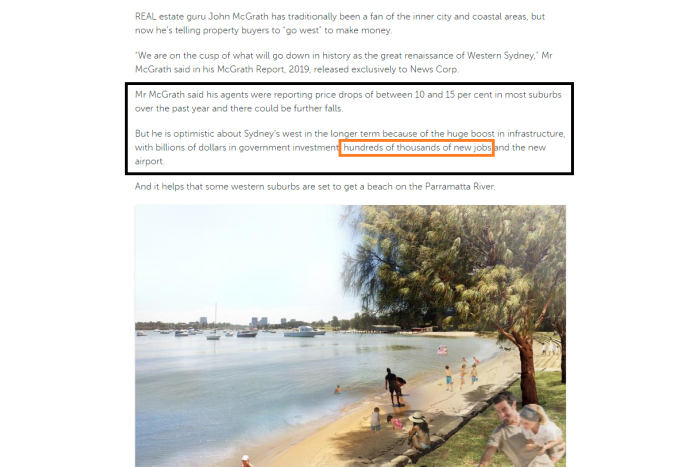 One such idea, is beaches along Parramatta River. The other, how Badgerys Creek Airport (construction) will create hundreds of thousands of jobs. Therefore and in their view, the West: from Parramatta to the South West Region of Sydney, are the next booming areas. Call me a conspiracy theorist, all you like. However, I say these are novel, all because – if the government were truly serious about decentralizing Sydney’s CBD, they would do all they can within their power, to create industry and jobs in the West. Also, incentivise major corporations to remain in the West, such as the CBA. Small shopping precincts and selling off land, to residential developers, is not the answer. Nor can the answer be found, in building a new Power House Museum in Parramatta and most definitely, not building beaches along a contaminated river. For years, I have heard how Parramatta is going to be the second CBD to Sydney’s CBD. What I have seen Parramatta turn into, is a slum of residential high-rise apartment. And residential construction, continues to overshadow any form of real and economic development. Street shops displaying For-Lease signs is the common window dressing. Meanwhile, along the main roads, vacant unoccupied shops, sit under the “mix-use” high rise residential developments. Some of the commercial space, has been vacant for over 7 years. The day I see, the proposed plans spelling out the transport route and how the fuel is going to be carted, from the Kurnell Refinery, is the day I may change my mind about the Badgerys Creek Airport. You may be the wiser, and you may take the advice from the “guru,” I for one, am skeptical about the hundreds of thousands of jobs, in and around the proposed airport. Show me the plans – and investors will show you the money. I believe there were proposed plans for the second NSW City, some 30 to 40 years ago and it was over the mountains. Great plans that were quashed by the typical – political fiasco and underhandedness of corruption. Don’t be surprised if construction is halted on the Second International Airport. 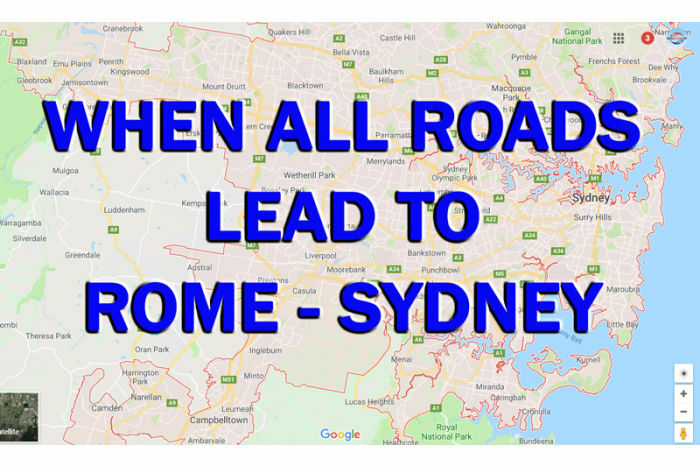 Don’t be fooled, by the golden beaches of Parramatta and most of all, ask yourself the question: why do all roads, lead to Sydney? Wait for post codes closer to the CBD, to become cheaper, before you buy-in. 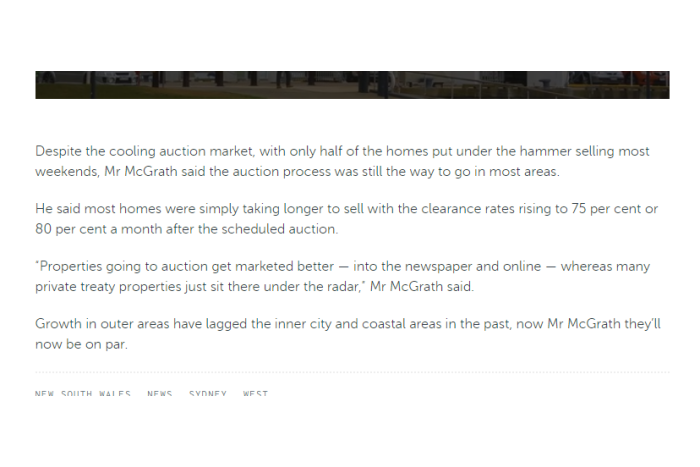 Some areas around the CBD are dropping in price and dropping faster than outer suburbs. I say, hang out for minimum 12 months before you buy. The City of Sydney will bounce back, I can’t say when just yet. Watch This Space for updates. One thing for sure, since all roads lead to Sydney, the master plan appears to benefit the Sydney CBD not the West. At this point in time, in any case. The Western Sydney regions, have a lot more to fall in price. These falls may well go into 2021, particularly if credit restrictions remain as tight as they are. Nonetheless, if beaches are going to drive the market upward, by 5 percent. I ask, how much more will the 2 billion dollar, stadiums? Personally, schools, hospitals ad industry may do the trick, but I'm not the politician. Just putting it out there. As always, feel free to email me edwin@ribbonproperty.com.au and we can have a free discussion, on all things property.